Discover a solid roof that is also a glass conservatory roof. Enjoy the best balance of light and comfort with this market-leading Ultraframe system. Call for advice today or go online for a free quote. Until recently, homeowners had to choose between a solid roof house extension or a glass based system. Fortunately, this is no longer the case. Transform the look of your Kenilworth, Leamington Spa or Warwickshire home instantly. Ultraframe solid roof house extensions solve the above dilemma by seamlessly blending the benefits of both systems. You can now enjoy a solid roof house extension without having to compromise on light or any other aspect of the design. Livinroof is a hybrid glass and solid roof house extension that uses market-leading components to create a room that looks as good as it performs. Contact the Fox Windows & Doors team today for more information or get an online quote within minutes. You want a roof system that will match incredible looks with incredible performance. The insulated pelmet that comes as standard with the Livinroof will ensure year-round comfort, contribute to that essential ‘real room’ feel, and reward you with a cost-efficient U-value as low as 0.16. Extensions are built in a variety of different shapes. The Livinroof has been designed to work with almost all of the popular styles. 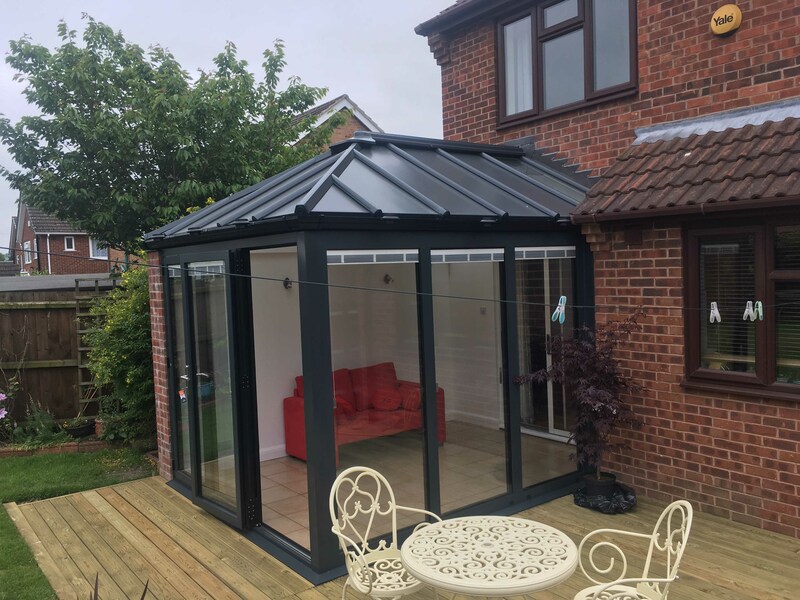 Whether you need a lean-to conservatory for a bungalow, or a large P-shaped conservatory for a detached property, our solid roof house extension will be compatible with your requirements. Make your new solid roof house extension stand out from the rest by asking Fox Windows to include super-insulated columns as part of your design. Ultraframe’s super-insulated columns far surpass the thermal qualities provided by masonry piers of the same size, and you can choose between fluted or plain designs. Light can make or break a house extension. You want your new room to feel bright and spacious, not dark and claustrophobic. The glazing in your new Livinroof can be cut to any shape and placed anywhere. This means you can tailor the appearance of your Livinroof and create stunning focal points. Your solid roof house extension will need to meet planning and building regulations. The Livinroof is incredibly light - lighter, in fact, than any other equivalent system currently available on the market. It weighs in at an incredibly low 36kg/m² and will comply with your local authority’s regulatory requirements in full. Livinroof has been rigorously tested as a fully assembled structure - not just by UItraframe, but by Warrington Fire. In both cases it met the assessment criteria in full and has achieved the fire ratings needed to make it safe. Buy your new Ultraframe extension from Fox Windows, knowing that it the safe option. In addition to super-insulated columns, your new solid roof house extension can include a decorative cornice. This will enable you to hide your roofline, rewarding you with much-improved external sightlines. Our cornices come in almost any colour and, if you choose the curved option, work with all the systems we sell. You want your new solid roof house extension to blend in with the architecture of your home and that of the local area. Livinroof features a neutral – but nonetheless impactful – grey shade that will ensure it fits in. Whatever size or shape extension you’re interested in, it’s sure to look outstanding when you choose Livinroof. The glass technology in your solid roof house extension will provide you with a room that’s comfortable year-round. Your Livinroof will block most solar rays from penetrating, so your space will never overheat. It will also stop unwanted drafts from penetrating, turning your new room into a cosy space during autumn and winter. Your Ultraframe solid roof house extension will include a certificate of authenticity that you can show to buyers if you decide to sell your home at a future point. Fox Windows will also provide you with a manufacturer’s warranty. We have been recognised by Which? Trusted Traders as competent to fit Ultraframe roof systems. Enjoy a modern and comfortable thermally efficient Livinroof extension. Design your room in VR and get an online quote. Find out about the many benefits of the Livinroof by contacting our expert team. We cover a wide geographic area that includes Kenilworth, Leamington Spa, Warwickshire, Stratford Upon Avon, Rugby, Coventry and the local areas. If you need a quote and don’t have time to call, you can use our online design tool to generate a solid roof house extension quote. You can also step inside your favourite Ultraframe product and look around by using our new VR tool.